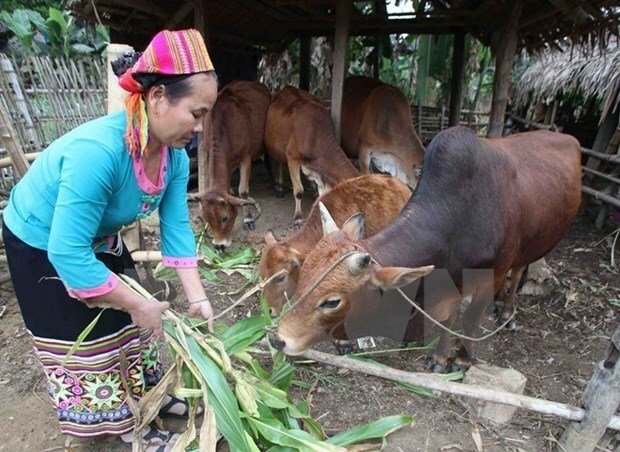 Hanoi (VNA) – The northwestern mountainous province of Dien Bien has seen strong progress in poverty reduction with more than 3,800 households escaping poverty in 2018. A survey released in 2018 showed that the province had more than 47,000 poor households, accounting for 37.08 percent of the total households, down 3.93 percent from 2017. The poverty ratio in districts covered by Resolution 30a on fast and sustainable poverty reduction decreased to 52.09 percent in 2018 from 56.84 percent in 2017. Dien Bien is working towards the target of reducing the number of poor households to about 44,000 at the end of 2019, including 39,000 in poor districts, or 33.97 percent. To that end, the province will continue strengthening communications and encourage locals to get rid of poverty and build new-style rural areas. Along with reviewing poverty reduction and social welfare policies and new-style rural area building programme, Dien Bien will support poor households to promote their own production with specific measures suitable to their conditions, thus helping them reduce poverty sustainably. Together with using central and local budget for the work, the province will actively mobilise resources from businesses, the society and community, while integrating capital of poverty reduction programmes into the new-style rural area building programme to develop commercial goods production and improve incomes for poor households. Dien Bien will also enhance the quality of occupational orientation and vocational training, increasing export of labourers, assisting the community affected by natural disasters, and supervising poor households in using loans for economic production. In 2018, Dien Bien had seven poor districts. Among 103 wards, communes and towns, 101 are of extreme poverty and 103 are covered by the 135 Programme on poverty reduction. In the year, total capital for the national target programme for poverty reduction in the locality was over 420 billion VND (18.06 million USD), including more than 310 billion VND of development capital. Over the past years, Dien Bien has focused on improving infrastructure system in poor localities, especially transport system. Meanwhile, it has made full use of advantages in land and forest to develop industrial and fruit tree farms, as well as livestock breeding.